Virtual currency investor complaints to the Consumer Financial Protection Bureau have reached an all-time high. 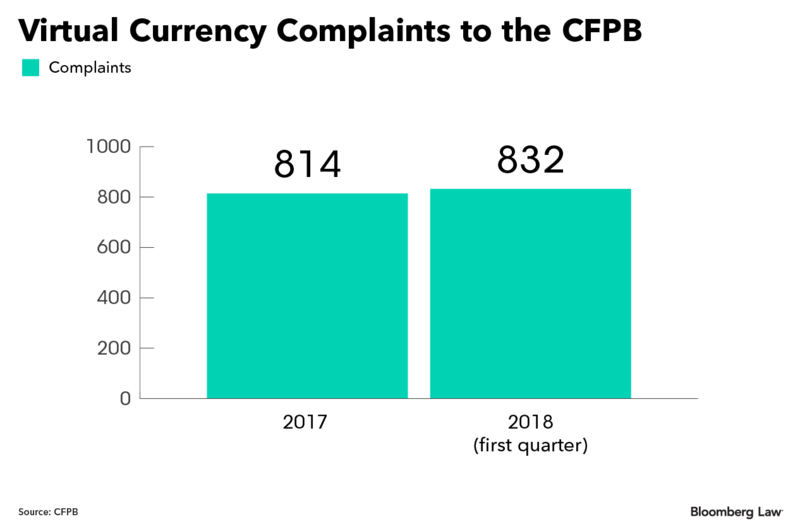 Consumers made 832 complaints about virtual currencies to the CFPB’s database in January through March of this year. That exceeds the 814 logged during all of 2017. The sharp increase in complaints to the CFPB isn’t surprising, given “the incredible public interest in almost any virtual currency,” Thomas Gorman, a partner at Dorsey & Whitney in Washington, told Bloomberg Law. The CFPB’s current authority over virtual currencies is unclear. The Dodd-Frank Act allows the agency to designate areas of the nonbank financial sector for supervision, and that authority was exercised in the past for markets including auto finance and student loans. These days, the bureau is less aggressive in supervising new areas as President Donald Trump pursues a course of deregulation. Dina Ellis Rochkind, who is of counsel at Paul Hastings in Washington, said she doesn’t see the CFPB “coming down hard” on virtual currency as long as Acting Director Mick Mulvaney is at the helm. “But he may use the bureau’s Office of Innovation to ensure that the industry works well for consumers,” she told Bloomberg Law in an email. The CFPB did not directly respond to a request for comment, but forwarded a 2014 agency advisory on the risks that virtual currencies pose to consumers. The Securities and Exchange Commission and the Commodity Futures Trading Commission have reached out to consumers to caution them about the risks of virtual currencies. The SEC set up the website HoweyCoins.com to educate investors on initial coin offerings. The CFTC has jurisdiction over virtual currencies that are commodities. SEC jurisdiction applies if the coin is classified as a security — some kind of investment beyond the specific coin. “Both agencies have been bringing primarily fraud cases, although the SEC has also focused on the failure to register the securities prior to their sale,” Gorman said. “In the future, I think you will also see the states and their various consumer agencies will be stepping up and playing a giver role in trying to protect investors and give them relief when things do not go well,” Gorman said. Unhappy consumers spell out their issues with virtual currencies in narratives to the CFPB complaint database. “I think it speaks to some of the big policy issues around how virtual currencies will be managed going forward,” Steven Ramirez, CEO of Beyond the Arc, an analytics firm based in Berkeley, Calif., told Bloomberg Law. Topping the mounting list of grievances was funds not being available when promised. 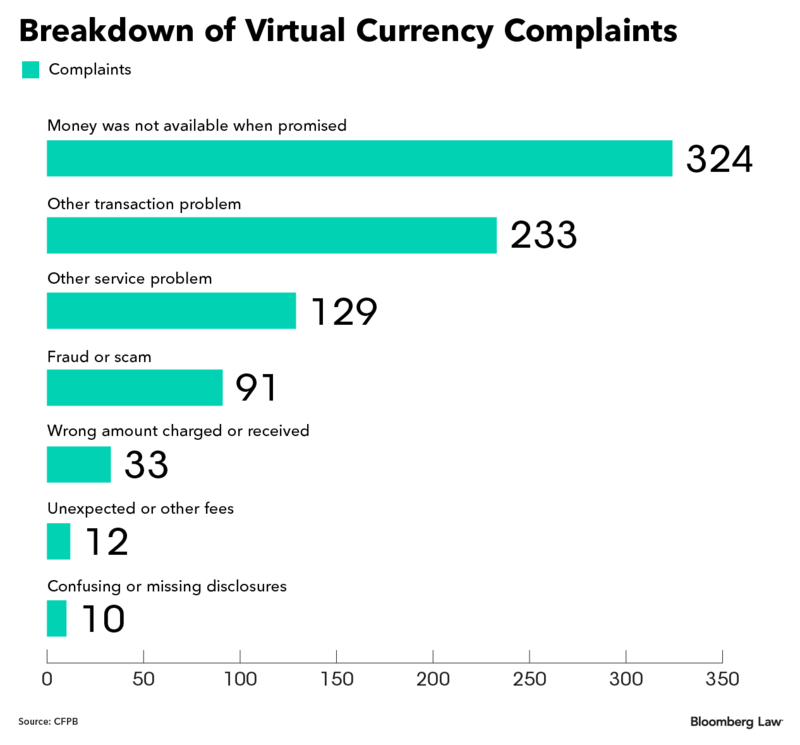 Consumers also griped about other transaction or service problems involving digital currencies. Fraud and scam issues made up about 11 percent of total complaints. At a June 8 CFPB forum in Topeka, Kan., Mulvaney questioned whether the agency should continue to make consumer complaints available for public viewing. Most of the CFPB complaints received in the first quarter of this year were directed at Coinbase, a digital currency exchange founded in 2012. “I signed up with Coinbase.com in order to deal in cryptocurrency, but have been seriously let down by their service, with no ability to withdraw my funds and no lucid support beyond irrelevant auto-responses,” one consumer wrote in January. The narratives reveal frustrated investors who expected the kind of stability found in more established financial markets, Ramirez said. Coinbase did not directly respond to a request for comment from Bloomberg Law. The cryptocurrency space experienced “a profound uptick in mainstream awareness and growth” in 2017, the San Francisco-based firm said in a blog post May 18. With surging consumer demand, the company’s transaction volumes in November and December grew by 295 percent. To handle the volume, Coinbase bolstered its support team and says it is able to resolve issues faster, the company said. The CFPB complaint database also revealed issues with verification — consumers unable to prove money in an account was theirs. That problem might be related to antifraud efforts by the crypto exchanges, Ramirez said.